My oldest daughter, the poet, wrote some more poems, and now they’ve been put together and published in a book. 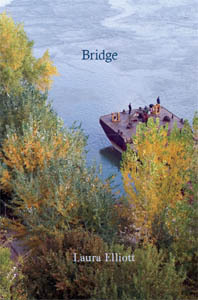 It’s called Bridge, and it’s available online from Gatehouse Press. And I might add, it’s well worth a read. And yes, I am shamelessly promoting my own daughter. But that’s not just ‘cos I’m her mum and it’s my job, it’s because she’s a wonderful poet and I’m really proud of her, as I am of all my children. And anyway, if “I carry books like babies on my hip” isn’t one of the best first lines of a poem, ever, then I don’t know what is. Visceral. That’s good. Nobody’s ever called my writing visceral. Arch, they say. Which is good. But visceral wins. Congratulations to your daughter Cath. It’s a wonderful talent to have. Hi Laura (via Cath) congratulations. Getting poetry published in an era when publishers chase profit is always an achievement. Best of luck with Bridge and with recovering vanished voices.